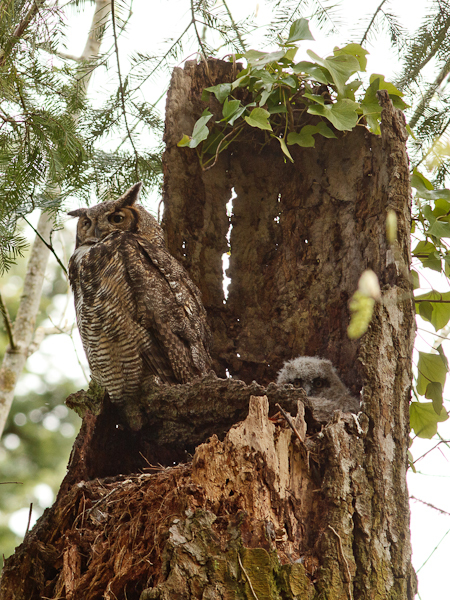 So yesterday, my brother Colin and I went out to see a hummingbird nest…And I realized we were quite near an area which has supported nesting Great Horned Owls for a number of years. I had never really had a tripod with me or a fast lens, so I had never gone into this dark and gloomy part of the forest to find it. Having both things on hand this time, we went to have a look, and to our surprise, the nest was quite visible from a nearby walking path! What a great day out! Here we can see one of the chicks poking its head out to have a look. 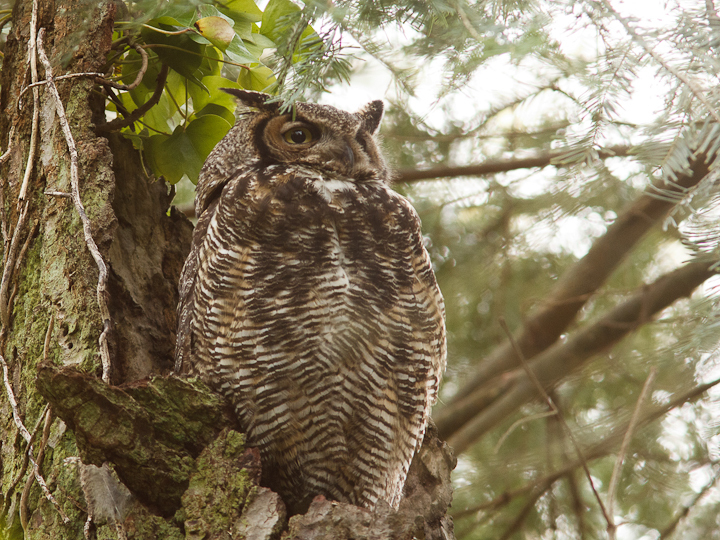 It may seem from these pictures that the adult was concerned we were there, but the majority of the time the bird seemed to be snoozing, only briefly opening its eyes. 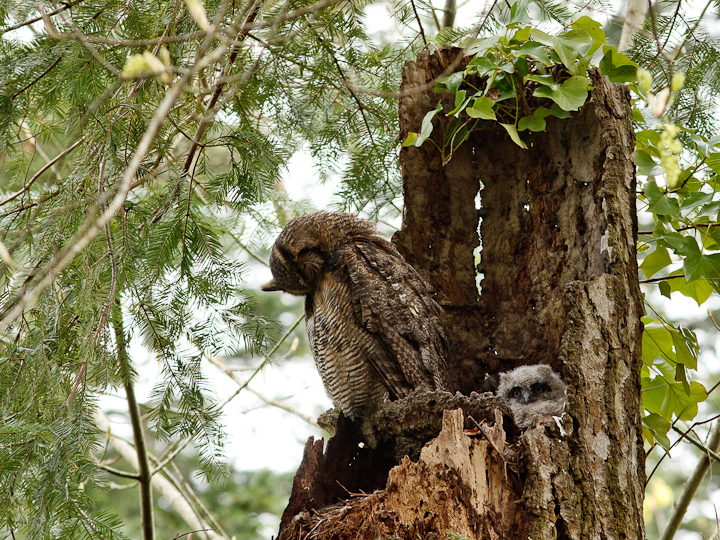 Here the adult does some preening, while the chick has a look at a dog walking by on the trail. 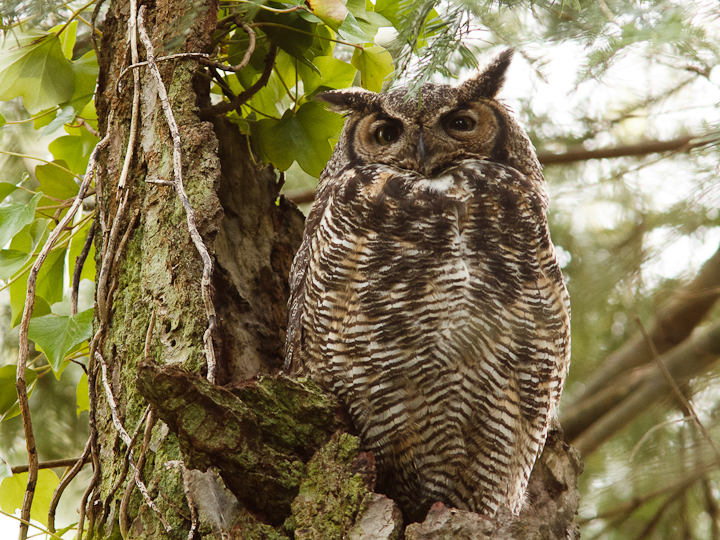 I love how distinguished these owls look. Here is a rare frame where the adult and the chick watch while we change positions. 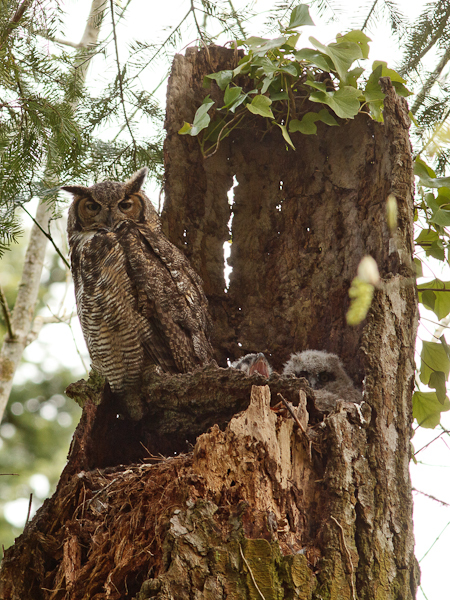 Here is a shot of the adult with two chicks, one alert and one yawning. 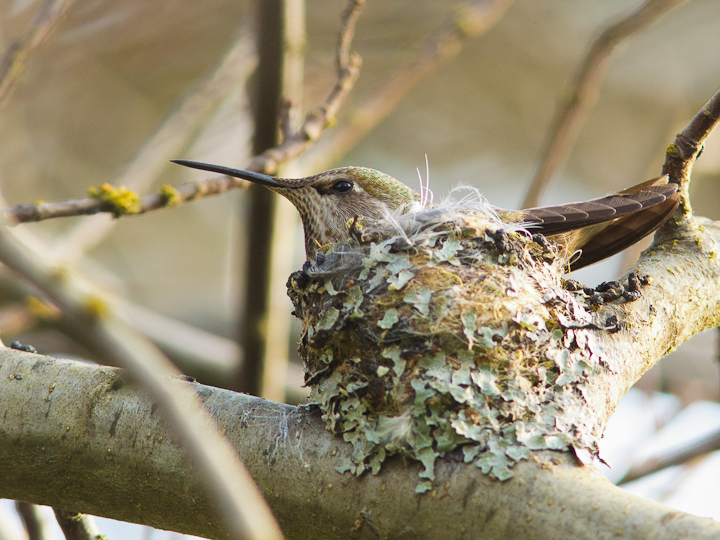 In case you are wondering what the hummingbird nest looked like, have a look at this beauty! 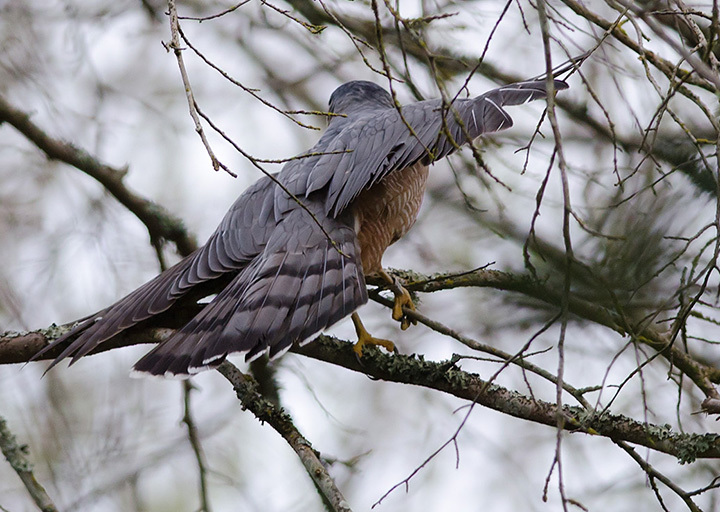 And in other bird nesting news, check out this shot my brother got of a Cooper’s Hawk grabbing a branch for a nest just behind where the hummingbird nest was! Photo by Colin McCann. 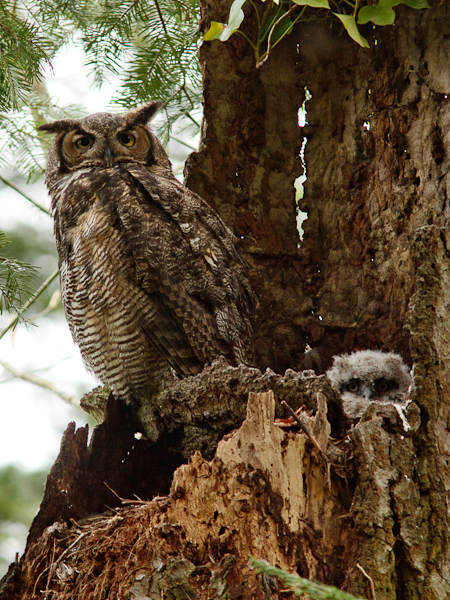 Some great photos of Great horned owls at a nest.